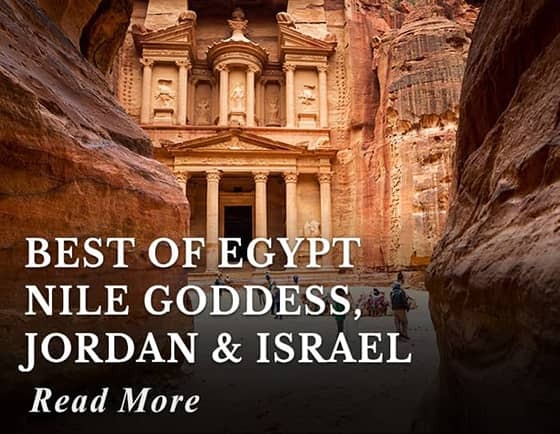 This tour offers visits to the most important biblical sites in Jerusalem and Bethlehem; you will also explore other of Israel's well-known antiquities. 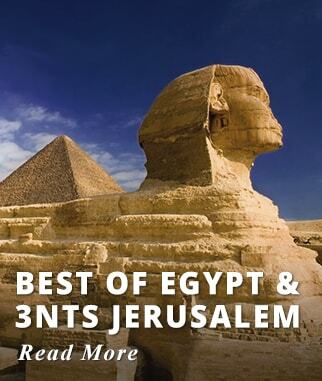 Arrive in to Tel Aviv for your first night, then continue in to Jerusalem for 3 nights. 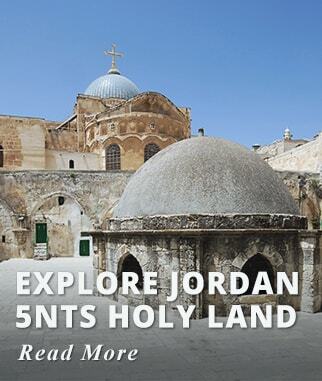 Accompanied by a licensed Guide tour all the diverse and most relevant sites in the Old and New Jerusalem and Bethlehem. Also included a visit to the Masada Fortress and panoramic drive through the City of Beer Sheba. 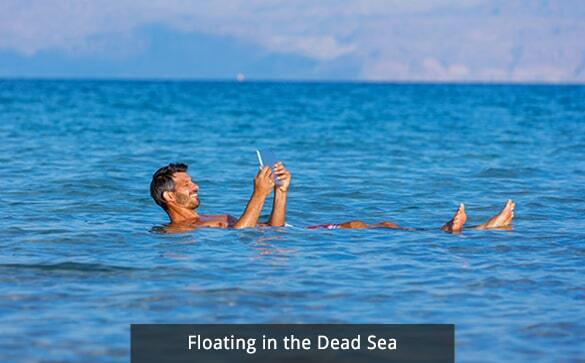 Descend to the shores of the Dead Sea for a "Float experience" in its therapeutic waters. Visit the Roman City of Beit Shean, Safed City of the Kabala and Nazareth. 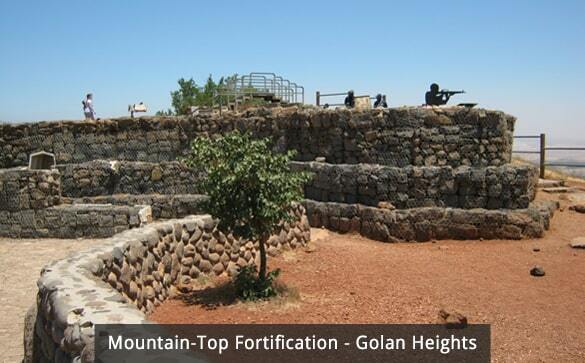 Continue with 2 nights in Galilee where you explore the Golan Heights and the surrounding sites around the Sea of Galilee. Experience the traditional Israeli community settlement by staying at a Kibbutz Hotel. 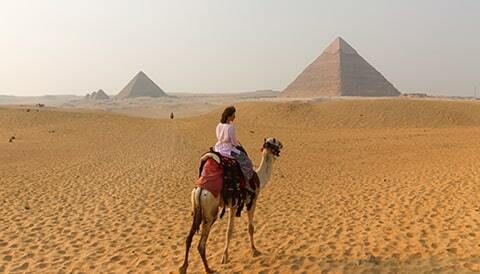 End your Tour with visits to the Medieval Fortifications of Acre, Haifa and Caesarea. Also enjoy a panoramic driving tour of Tel Aviv/Jaffa. All departures are guaranteed, our prices include international airfare, meet and assist services, accommodations with breakfast daily, sightseeing, entrance fees, all transfers, and all taxes there are no hidden costs. Prices are valid for weekly Saturday departures through 2019 until December 07, 2019. 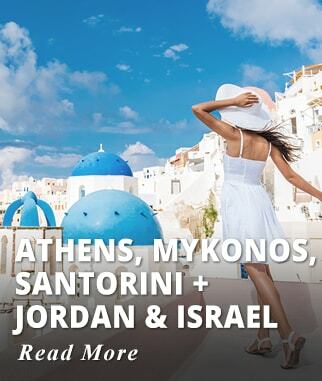 Prices are higher for departures during summer (May 05 to Sept. 10), Christmas, New Years, Jewish holidays and Easter. Prices are per person based on double occupancy, Single Supplement $599 USD. 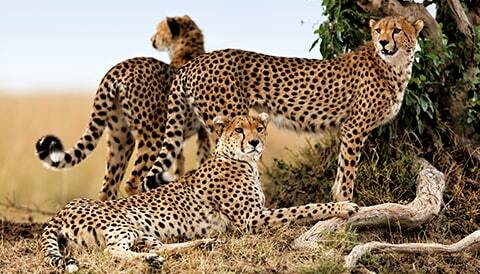 USD 249 Extra per person based on double (CAD 339) Single travelers pay single supplement. Tel Aviv: Metropolitan Hotel, Grand Beach Hotel or Similar. Jerusalem: Grand Court, Leonardo Hotel or Similar. Galilee: Kibbutz Kfar Hotel or Similar. Board your International flight to Tel Aviv, we offer departures from most major cities in Canada and the USA. Arrive at Tel Aviv's Ben Gurion International Airport, after clearing customs and immigration meet our Representative who will assist you with transfer to your Hotel. Accommodation: Seanet Hotel, Gilgal Hotel, or similar. Activities included today: Arrival to Tel Aviv. Breakfast at the Hotel then you drive south of Tel Aviv for a drive through the City of Beer Sheba, the largest City in the Negev Desert. En route you pass Ashdod and Ashkelon, making a stop to view the northern part of the Negev Desert. 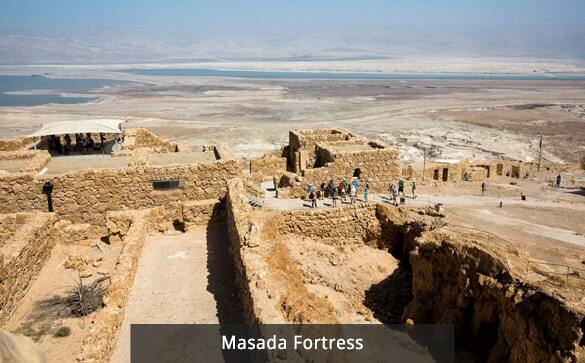 Arrive to Masada, take a cable car to the top of the Mountain where this beautiful Fortress is located. 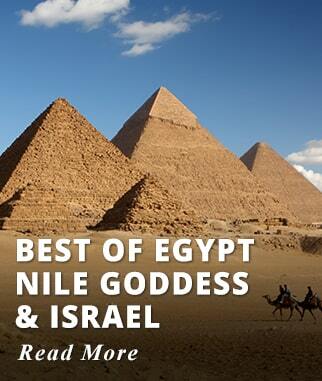 From there also enjoy magnificent views of the Dead Sea. Masada is a World Heritage List UNESCO site, built by Herod the Great King of Judea, some of the highlights you will visit within the complex are: King Herod's Palace, The Synagogue, and the Bathhouse. Later descend to the shores of the Dead Sea and enjoy the unique experience of floating in the salty waters of the Dead Sea. Check in at your Hotel in Jerusalem and Overnight. Accommodation: Jerusalem Gold Hotel or Similar. Upgrade at an extra cost to Grand Court Hotel Jerusalem or similar. Activities included today: Short visit to the Negev Capital of Beer Sheba, Visit Masada Fortress and the shores of the Dead Sea. Drive to Jerusalem for overnight. After breakfast, visit the Israel Museum's Shrine of the Book; This wing of the Israel Museum is a beautiful and unique building that houses the first Dead Sea Scrolls found in a Cave at Qumran by the Dead Sea. Then a visit to the scale model of the Herodian City of Jerusalem, this very impressive model depicts the City of Jerusalem in the Second Temple Period. Continue to Yad Vashem Holocaust Memorial Museum, Israel's official Memorial to the victims of the Holocaust located in the New Jerusalem. See displays of pictures and written accounts that depict the suffering of the Jewish people during World War II. Later drive to the charming Village of Ein Karem. Ein Karem is where John the Baptist was born and raised; now home to several monasteries and Churches is a tranquil Town with vineyards and trees but also trendy stores and outdoor restaurants. Visit Bethlehem the birthplace of Jesus at the Church of the Nativity and Manger Square. Activities included today: Visit Israel's Museum - Shrine of the Book, Yad Vashem, and the Village of Ein Karem. Visit Bethlehem the birthplace of Jesus at the Church of the Nativity and Manger Square. After breakfast at the Hotel, your Guide will take you on tour of the Old City, walk through one of the gates of the walled Old City visiting, The Jewish Quarter: wander through its ancient alleyways lined with many interesting shops and traditional restaurants. 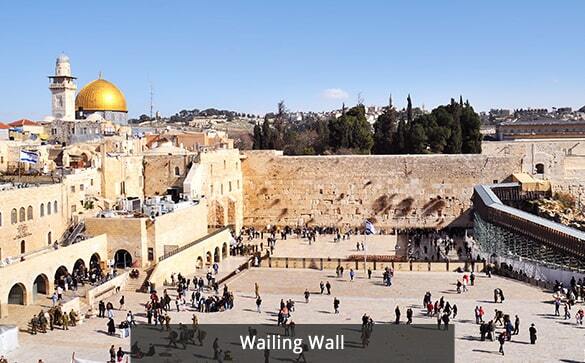 Wailing Wall: Also known as the Western Wall is the most visited and sacred place for the Jewish faith, is all that remains of the four walls built by Herod the Great to support the Temple of Jerusalem. Via Dolorosa: "The Way of Grief," in Latin. Via Dolorosa is located in the old city of Jerusalem and is a path where Jesus was lead in stifling pain carrying the cross of crucifixion. 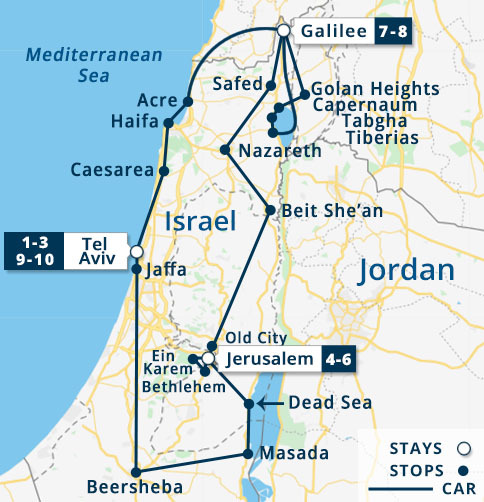 Walk the Fourteen stations located along this path, based on events which happened on the way to the Golgotha hill, the site of the crucifixion. Church of the Holy Sepulcher: Known as the place of both the crucifixion and the tomb of Jesus of Nazareth The church has traditionally been a major pilgrimage center for Christians all around the world. Mount Zion, A holy site shared by people of Jewish, Christian and Muslim faiths, the Temple Mount is the highest point of the ancient City of Jerusalem. 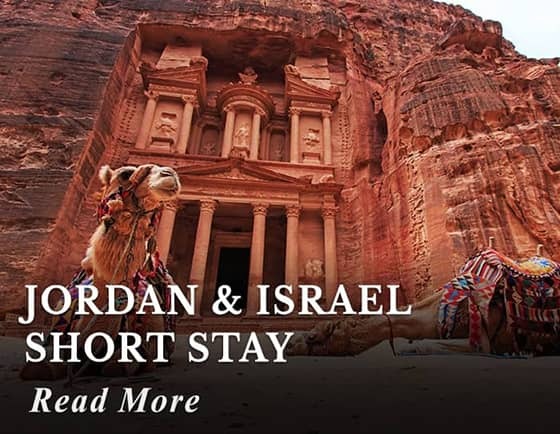 Here you visit The Tomb of King David, The Room of the Last Supper and Dormition Abbey which is a Monastery built in memory of the Virgin Mary. 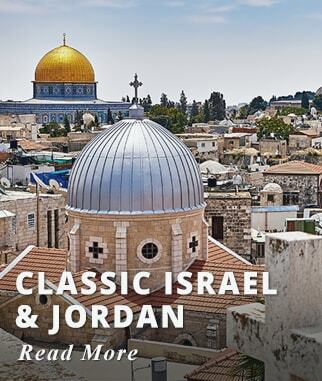 Enjoy panoramic views of Jerusalem from atop the Mt. of Olives. Visit the Garden of Gethsemane. Walk amongst the ancient olive trees of this Garden, believed to be the place that Jesus and his disciples came to after the Last Supper, visit the adjacent Basilica of the Agony also known as the Church of all Nations. Visit Mahane Yehuda to experience the flavors, aromas colors of the largest market in Israel. Return to your Hotel. 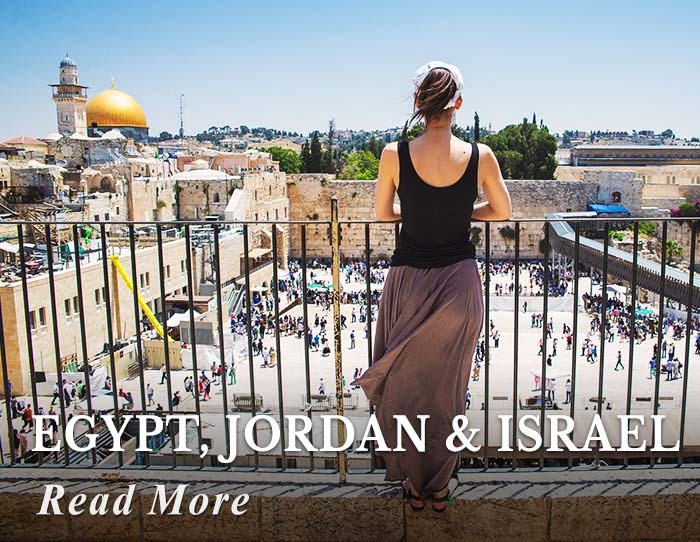 Activities included today: Visits to The Jewish Quarter, Wailing Wall, Via Dolorosa, Church of the Holy Sepulcher, Mount Zion, The Tomb of King David, The Room of the Last Supper, Dormition Abbey. 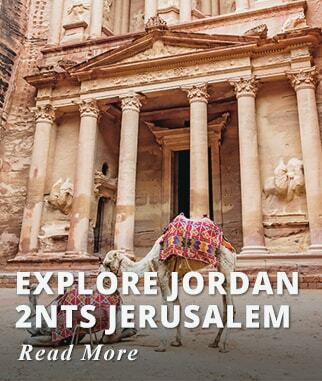 Enjoy Panoramic Views from atop the Mount Of Olives, visit Gethsemane and Israel's Market of Mahane Yehuda. After breakfast drive through the beautiful Jordan Valley to visit the archeological remains of the ancient Roman City of Beit Shean, see the excavations; be amazed by its columns the impressive Theater and the bathhouse. 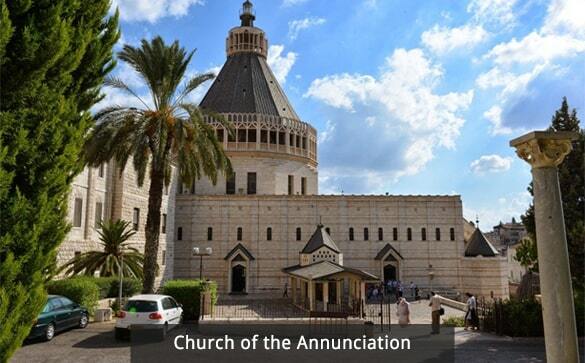 Continue to Nazareth to visit the Church of the Annunciation this impressive two-level Basilica was built at the site where the Archangel Gabriel appeared to the young Virgin Mary, on the lower level you find the cave home of the Virgin Mary. In the same area visit Saint Joseph Church built on the site where the house of Joseph and the holy family was located. Proceed to Safed, City of Kabbalah and center of Jewish mysticism, to visit the beautiful streets of the artist colony. Today get a Kibbutz experience; overnight at a Kibbutz Hotel In the Galilee. Accommodation: Kfar Giladi Kibbutz Hotel. Activities included today: Visit City of Beit Shean, Basilica of the Annunciation Complex, and Safed city. Breakfast at the Hotel, then you drive to the Golan Heights, passing by Banias the source of the Jordan river, former Syrian Fortifications, and the Druze villages. 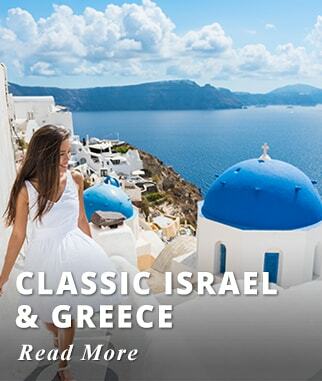 Enjoy an Israeli Wine Country Experience, with vineyards surrounded by breathtaking views. The visit Includes wine tasting. 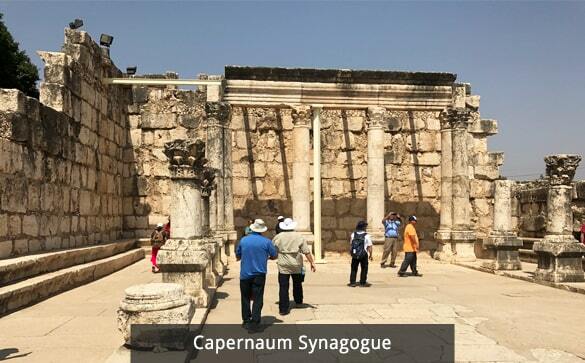 Descend to the shore of the Sea of Galilee and proceed to the town of Capernaum, to visit The ruins of the Ancient Synagogue, Mount of Beatitudes, the traditional site of the Sermon on the Mount and Tabgha, where the miracle of the fish and bread took place. Continue to Tiberias for a short tour of the old center of Jewish learning. 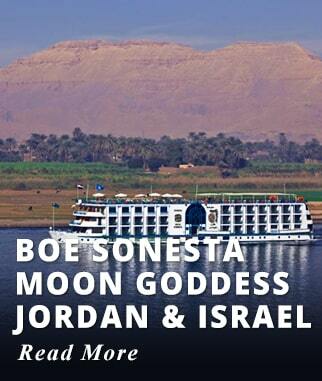 Optional sailing in a boat across the Sea of Galilee to experience the tranquility and scenery little changed during the past 2000 years (subject to conditions and fee paid locally). 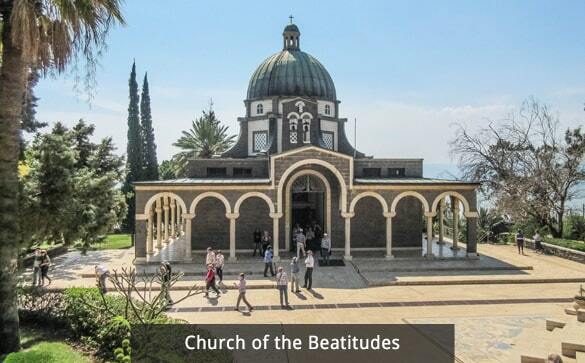 Activities included today: Travel through the Golan Heights, enjoy a wine tasting, visit Mount of Beatitudes, the Ancient Synagogue at Capernaum, Tabgha, and Tiberias. This morning after breakfast drive west to visit Acre (also known as Akko) this ancient crusader City is a UNESCO World Heritage site, wander through the beautiful medieval fortifications and tunnels. Continue to Haifa where you will enjoy a panoramic sightseeing City tour of one of the most beautiful Cities in the Middle East. 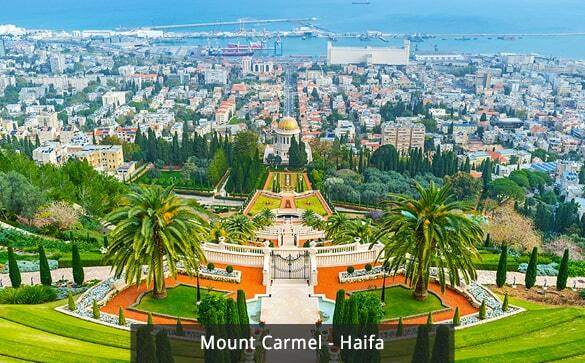 Haifa is the World Center of the Bahai Faith famous for its magnificent gardens. Visit Mount Carmel and get beautiful views of the sea, Haifa Bay and the City below. Keep driving along the coast to Caesarea National Park, one of Israel's most important archeological sites see the Harbour built by King Herod, the Hippodrome, and the restored Roman Amphitheater that in the summer months holds music events. Later drive back to Tel Aviv, on the way enjoy a panoramic driving tour of the ancient Port City of Jaffa. Explore the alleyways and narrow streets lined with unique stores and art galleries that make this area a favorite with tourist and locals alike. Some of the highlights are the walls of the Old City, the seaside promenade, and the famous flea market. Check in at your Hotel. Overnight in Tel Aviv. Accommodation: Sea Net Hotel, Gilgal Hotel or Similar. Activities included today: Visit Acre, Haifa, Mount Carmel and Caesarea National Park. Short panoramic City Tour in Haifa. After breakfast, our representative will transfer you to the airport for your flight back home. Two nights of accommodation in Tel Aviv, Seanet Hotel, Gilgal Hotel or Similar. 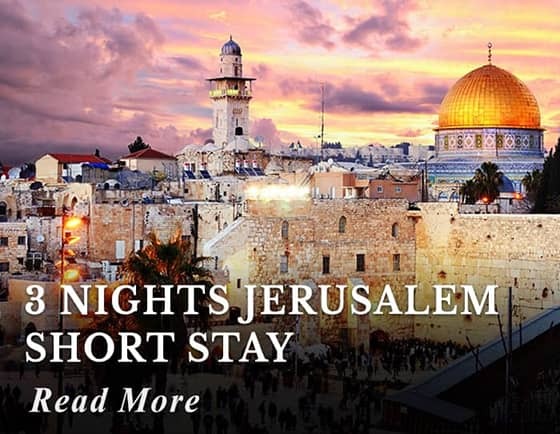 Three nights of accommodation in Jerusalem, Jerusalem Gold Hotel or Similar. Two nights of accommodation in Galilee at Kibbutz Kfar Giladi. Panoramic drive passing by the Cities of Ashdod, and Ashkelon. A short visit to Beer Sheba the largest City in the Negev Desert. Experience a dip on the Shores of the Dead Sea. 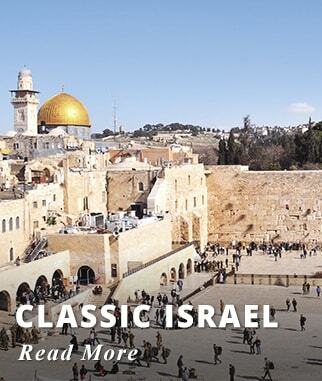 Visit Israel's Museum Shrine of the Book with the famous Dead Sea Scrolls and the Herodian model of the City of Jerusalem. Visit the Village of Ein Karem. 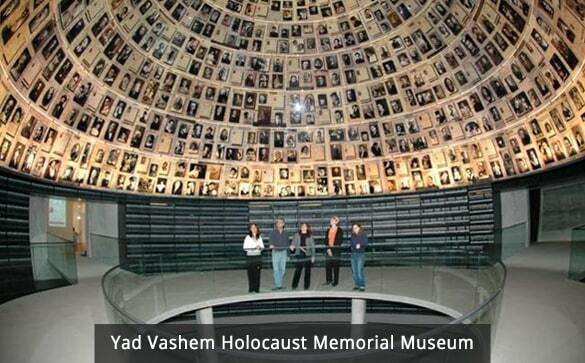 Visit Yad Vashem the Official Memorial to the Holocaust Jewish victims. Visit Church of the Nativity and Manger Square in Bethlehem. Visit the Western Wall also known as the Wailing Wall. Walk the way of the Cross, The Via Dolorosa. 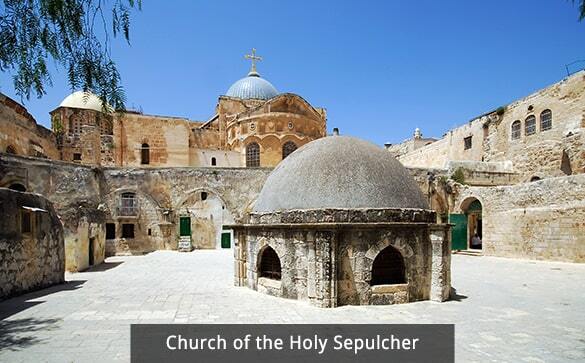 Visit the Church of the Holy Sepulchre. 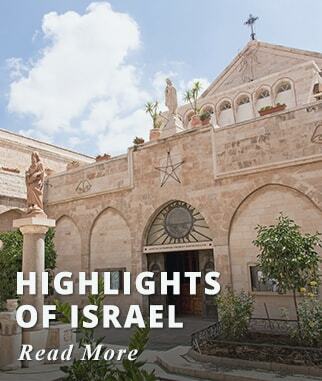 Visit Mount Zion with the traditional Tomb of King David & Room of the Last Supper. 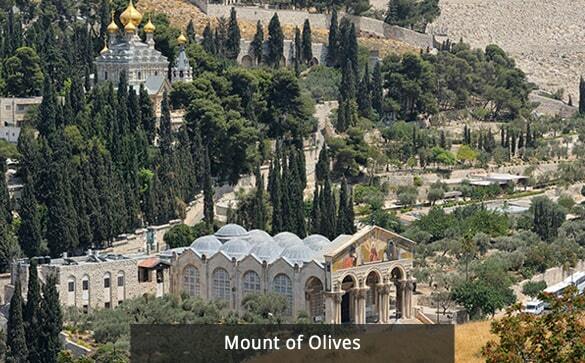 Enjoy Panoramic views of the Old City from atop the Mount of Olives. Visit Israel's largest market Mahane Yehuda. Visit the ancient Roman City of Beit Shean passing thru Jericho on the way. In Nazareth tour, the Basilica of the Annunciation complex; visiting Home of the Virgin Mary, and Saint Joseph Church. Tour Safed City of Kabala, visiting the Synagogue and the Artist's Colony. Experience two nights stay at a Kibbutz Hotel. 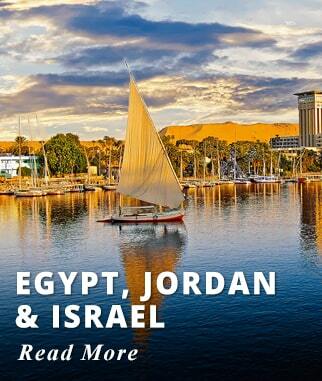 Travel through the Golan Heights and around the Sea of Galilee; passing Syrian Fortifications, enjoy a wine tasting, visit the Mount of Beatitudes, Tabgha, and Tiberias. 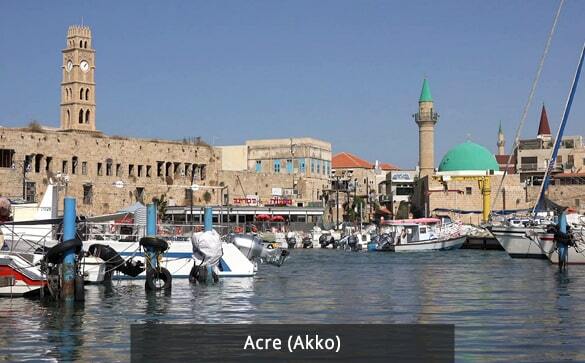 Visit the Medieval fortifications in Acre also known as Akko. Panoramic driving City Tour of Haifa, including The Baha'I Shrine, and Haifa Bay. Visit the ancient ruins of Caesarea. Short panoramic Tour of Tel Aviv and the ancient Port of Jaffa. 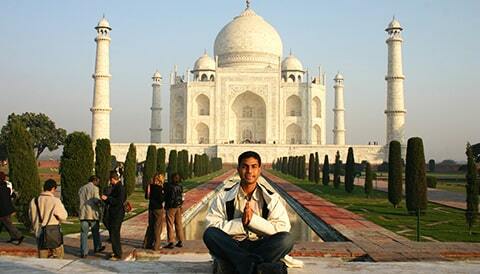 Tours provided on a Coach Bus with Licensed English Speaking Tour Guide. Sightseeing provided onboard air-conditioned Coach Tour Bus. Customary tips for the driver, guides, hotel staff, etc.